Once again we are fortunate to have Joby Bell play a concert at Bethel Lutheran Church in Rochester. The Concert will be Friday, September 7, at 7:00 PM. The workshop/master class will be on "Preparation and memorization of organ literature"; this will also be held at Bethel on Saturday, September 8. Gather at 8:30 AM for morning refreshments and conversation; the class will begin at 9:00 AM. The progressive organ concert in Winona to be held Sunday, October 19, 2005, will begin at 3:00 p.m. in the Chapel of the Angels. Each mini concert will last about 20 minutes; 10 additional minutes will be allowed between concerts for travel time. Organs to be heard will include a romantic Kilgen, an 1889 Moline tracker, a recently enlarged Casavant, and mid-20th century Austin organ. Performers will include Sue Fortney-Walby (Viroqua, Wisconsin), Jane Lindner, Patricia Lundeen, and Janusz Szlubowski (Winona, Minnesota), and Brian Williams (Rochester, Minnesota). After the last concert at St. Paul's Episcopal, Choral Evensong will be sung by the Motet Choir of Calvary Episcopal Church, Rochester. The public is invited and encouraged to attend all the afternoon events. Dinner will be held at the Green Mill in Winona following Choral Evensong. If you wish to attend the dinner, please contact your Chapter Dean, Jeff Daehn (SEMN) or Louise Tempte (Riverland), to make your reservation. The final event for the 2003-2004 season will be a pipe organ concert given by Peter DuBois of New York. This event, sponsored by the Chapter and The Congregational Church, is also in celebration of Rochester's Sesquicentennial year. Mr. DuBois will bring greetings from William A. Johnson, Jr., mayor of Rochester, New York to our mayor, Ardell Brede. The cornerstone of the program will feature the newly enlarged 3/35 Reuter pipe organ upon which Mr. DuBois will present a stunning program. 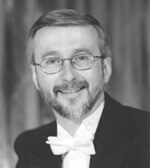 Peter DuBois serves as Director of Music/Organist at Third Presbyterian Church, Rochester, New York, a position he has held since September 1991. He oversees a large and active music and arts ministry there. In 2001 he was appointed assistant professor of Sacred Music and Director of the Sacred Music Diploma program at the Eastman School of Music. Prior to his appointment at Third Church, he served for 10 years as Director of Music/Organist at Christ United Methodist in Charleston, West Virginia. He also taught organ at West Virginia Wesleyan College and the University of Charleston. Critically acclaimed as a "world class" talent, Peter has performed at numerous colleges, AGO Chapters, and churches in Arizona, California, Connecticut, Tennessee, New York, Delaware, Ohio, Indiana, Pennsylvania, Maryland, Massachusetts, Michigan, Missouri, Florida, South Carolina, Virginia, West Virginia, and Texas. In addition, he has performed at the Piccolo Spoleto Festival in Charleston, South Carolina; at the Washington National Cathedral; at the Kennedy Center for the Performing Arts in Washington, DC; and in numerous master classes. Suggested donations will be received at the door: $8 for adults, $6 for seniors/students, and $18 maximum for families.